Jewish superstars Avraham Fried and Lipa Schmeltzer highlight in an evening fit for Broadway – the live finals of the Tzivos Hashem Power of Jewish Children Competition. Mark it in your calendars; this is an evening not to be missed. Over the past few months, children internationally, and from all divisions of Judaism, have been sending in a documentation of their talents to Tzivos Hashem world headquarters in NY. Children, who can sing, dance, draw, and even memorize thousands of lines of psalms, have sent in over 750 auditions, hoping to be picked to perform at the closing event; the Jewish Kids Got Talent Finals. Tzivos Hashem – Jewish Children International, now in its 30th year, was established upon the urging of the Lubavitcher Rebbe, in order to put every Jewish child under 13 years of age on the forefront of making the world a place where goodness and kindness prevails. Since its inception, Tzivos Hashem has become a global movement, using books, magazines, youth groups, Bar and Bat Mitzvah Clubs, the Birthday Club, contests, workshops, The Jewish Children’s Museum, Expo’s, and world-wide rallies via the internet to educate and inspire over a million children who have joined to usher in a new era of good. Through its unique ranking system, where children join the Torah army and ascend from Sergeants and Colonels to Generals, Tzivos Hashem has become the largest Jewish Children’s member organization in the world. This spectacular event will take place on March 27th at BAM, The Brooklyn Academy of Music. The 3 finalists from each of the three competition categories Heart – Chessed/Kindness, Hand – Performance, and Head – Achievement, will showcase their talent at the concert through an array of musical performances. These children will be competing for a share in $30,000 worth of prizes, for themselves and a non-profit of their choice. There will also be performances by Sparks Choir, Shira Choir, and acclaimed dancers, Redwine Dance Group. A star studded, panel of Judges, will critic the performances and announce the final winners from each category. Judges announced so far are, Cat Greenleaf of NBC NY, Nancy Spielberg – producer, Yossi Green – Jewish Musician and Composer, Danny Kaizler – concert producer, with more to be announced in the coming weeks. 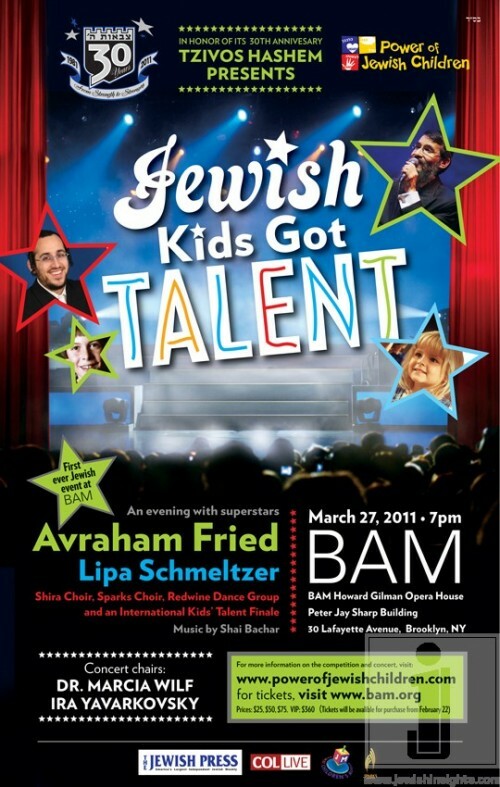 Tickets are on sale now by calling (718) 907-8800 and on the webby clicking www.BAM.org/JewishKidsGotTalent or calling (718) 636 – 4100 EXT. 1. Ticket Prices: $25 – $50- $75 – VIP $350.